At Smile Team Dental in Belleville, family dentistry includes even the youngest members of the family! Minimizing the chance of tooth decay and gum disease. 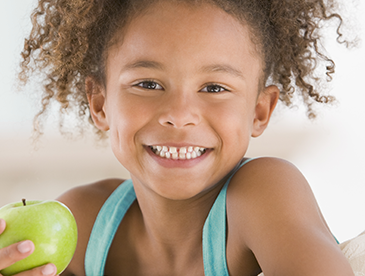 Children can get tooth decay from a young age in the same ways that adults can. Children who have a bottle of milk or a soda before bedtime are especially susceptible to this. A kids’ dentist in Belleville can reverse any early signs of decay or disease. Ensuring that the child’s bite is coming in correctly. Early detection of emergent pediatric dental issues can minimize or even prevent the need for orthodontia later on. Improving the child’s eating and speech. Healthy teeth allow the child to chew properly and speak clearly. Problems with eating or speaking that begin in childhood can carry on to adolescence and even adult life. Preventing fear of regular dental care. Visiting the children’s dentist in Belleville helps your child to grow accustomed to regular dental care. This can prevent the intense fear of the dentist that some people unfortunately experience as adults. A good first pediatric dental experience is important to advoid fear of future dentists office visits. That is why the pediatric dentists at Smile Team Dental provide a warm, friendly atmosphere for your child's first dental appointment. There are some important steps in your Children's Dental Care, if proper care is established early; good dental habits can stay with your child for life. The pediatric dentists at Smile Team Dental are experienced at treating all ages, and we recognize the different dental needs at each stage of life. Our dentists can treat the entire family, whether a Child's bite needs correction with braces, or your child has a cavity, we will restore your childs smile with the least amount of stress possible. Make an appointment with our pediatric dentist office today to see our Belleville Children's dentist. Smile Team also proudly serve patients in the surrounding areas of Swansea, Fairview Heights, Edwardsville, Collinsville, Saint Claire, Madison County, Cahokia, Granite City, Shiloh, Dupo, Scott Air Force Base, O'Fallon and Alton, Illinois.